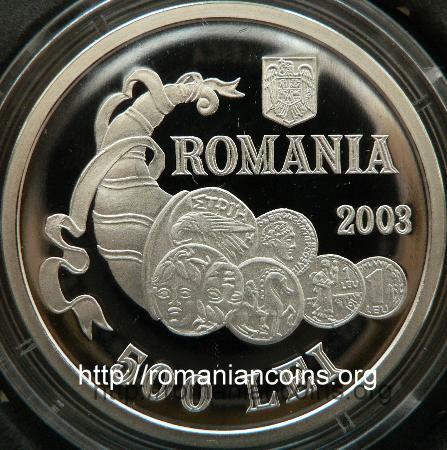 Obverse: Romanian coat of arms, ROMANIA, year 2003, face value 500 LEI and a horn of plenty releasing six coins Reverse: inside a linear circle the RNS ensign: Roman goddess Minerva, with shield and helmet, bearing a torch. Along the rim lies inscription "CENTENARUL SOCIETATII NUMISMATICE ROMANE 1903-2003" meaning "CENTENARY OF THE ROMANIAN NUMISMATIC SOCIETY". The years are delimitated from the rest of the inscription on each side by a rhombus and a fir branch. From the cornucopia several coins emerge. The upper left is a Istros drachma with sea eagle clawing dolphin and inscription IΣTPIH (ISTRIE). On the upper row there is also a Roman coin issued by emperor Trajan, the conqueror of Dacia. 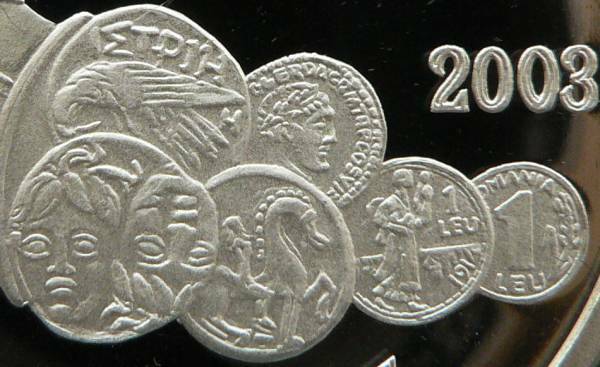 The lower row starts with another Histrian drachma, the two reversedly placed heads being visible (characteristic to numismatic issues of the fortress. A Dacian coin follows. The series ends with the 1 leu spinner of 1914 and a more recent piece, 1 leu of 1993. They kind of stole the pattern of our front page! They clearly intended on concisely symbolizing the Romanian numimatics (though missing out completely the medieval Romanian mintage). Using a magnifying glass the inscription on the Roman coin can be read: GGERDACPMTRPCOSVIP, that seems to be a part of the legend written in the dedicational dative IMP[ERATORI] TRAIANO AVG[USTO] GER[MANICO] DAC[ICO] P[ONTIFICI] M[AXIMO] TR[IBUNICIA] P[OTESTATE] CO[N]S[ULI] VI P[ATRI] P[ATRIAE]. The legend appears, for instance, on the renowned denarii and aurei bearing on the reverse the Trajan's Column. The coin was engraved by Vasile Gabor, Ştefan Ursachi being credited with the design. 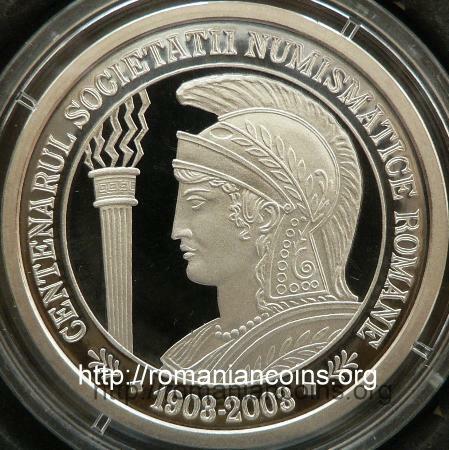 Accordingly to the coin presentation pamphlet, the Romanian Numismatic Society has 24 branches and over 1000 members. We want to thank Mr. Mata Baciu Cezar, that was so kind and sent pictures.